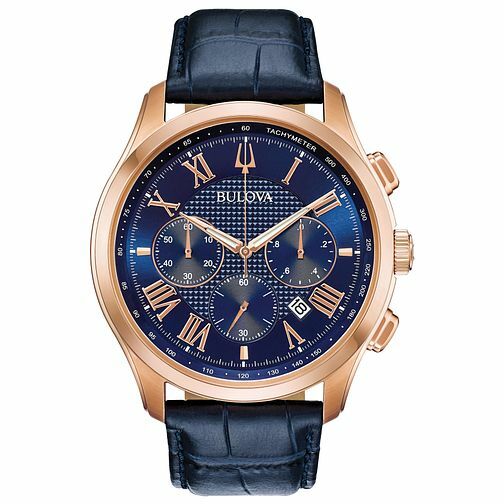 This Bulova men's Wilton Chronograph watch has a stainless steel case with a rose gold coloured plating. The blue 6-hand chronograph display and sub dials are complimented by the rose gold highlights on the dial, complete with a date function. The domed mineral crystal glass gives a unique feel to this timepiece. A deployment buckle with easy-to-use pushers give this watch great comfort and usability. This watch is water resistant to 30m. Bulova Men's Classic Wilton Blue Leather Strap Watch is rated 5.0 out of 5 by 1. Rated 5 out of 5 by Anonymous from Gorgeous watch This is such a fantastic looking watch, the dark blue face and strap complements the bright rose gold. The hands glow in the dark and because it's a fairly chunky watch you can instantly see the time clearly. The price is fairly low for the looks, quality, and above that it's also a Bulova. Awesome.